New York’s transit workers have enormous leverage over Amazon. But to use it, they will have to break with Andrew Cuomo. On November 13, news broke that Amazon would build new offices in New York City and outside Washington DC, with plans to bring roughly twenty-five thousand white-collar employees to each location. The announcement followed a multiyear search process in which the company received detailed bids from hundreds of cities, many offering the company billions in public money. In New York, the state and city governments have offered Amazon more than $2 billion in subsidies, and the project may qualify for additional federal tax breaks. The site in Long Island City, Queens now slated as the location of the new Amazon campus had previously been set to house 1,500 new affordable housing units. In New York, protests against the deal mobilized almost immediately, citing, among other things, a lack of transparency and community input. Others noted the severe impact the development will have on rents and infrastructure across the dense working-class neighborhoods of Western Queens. Workers might have hoped that the state and city giving away billions to one of the country’s largest companies while severely underfunding the city’s major working-class institutions like public colleges, public transit, and public housing would induce the city’s organized labor movement to offer a strong and unified opposition. This is especially true because union-busting Amazon tends to drive down wages wherever it goes — not just for its own workers, but for everyone. Such hopes, however, would be met with disappointment. So far, two unions have spoken out against the Amazon deal. The Retail, Wholesale and Department Store Union (RWDSU), which continues to wage a tough organizing campaign at Amazon-owned Whole Foods, issued a blistering statement. And Barbara Bowen, the president of the Professional Staff Congress (PSC), told the union’s paper, the Clarion: “The key issue is the giveaway of public resources…Billions in state resources are being handed over to Amazon while CUNY is being starved of funds.” The PSC represents roughly twenty-five thousand faculty and staff across New York City’s massive city college and university system (CUNY). On the other side, heads of the Building and Construction Trades Council and SEIU 32BJ (which largely represents building maintenance and security workers) both came out in favor of the deal, citing agreements to create new job opportunities for their members. Other unions have remained silent. The task of leftists is to foster more member-focused and political unions that can organize for the whole class. But as things stand now, most union leaders have no incentive to speak up, nor any real structural leverage to put teeth behind any criticism they might make. Those unions that are neither actively organizing at an Amazon-owned company nor receiving promises of new jobs for members can reasonably argue they have no dog in the fight. They might ask, why provoke a governor notoriously sensitive to the appearance of disloyalty over an issue that does not affect their members at work? One union, though, has both a strong claim that the Amazon deal will harm its workers and the potential leverage to use it to extract concessions from the state on behalf of both itself and working-class New Yorkers as a whole: Transport Workers Union Local 100. By explicitly allying itself with community demands drawn from the surrounding neighborhoods, Local 100 could both strengthen its hand in negotiations with the transit authority and strengthen anti-Amazon community organizing by creating a plausible threat of real pain to the city’s economy and to Cuomo’s reputation as the unassailable boss of New York if the company doesn’t offer the city more. Local 100 represents nearly forty-one thousand workers across New York City’s public transportation system, and their current contract expires in May 2019, well before major construction on Amazon’s new location is scheduled to start. While the union has generally avoided the worst concessions Cuomo has inflicted on other public sector unions, it seems fairly likely that MTA, the state-run agency that administers the city’s transportation system, could demand significant givebacks this round. As part of the state’s pitch to the company, representatives of the MTA met with Amazon specifically to tout the agency’s future expansions. But those plans are not funded. And just two days after Amazon announced its plans, the MTA declared that its financial future is dire. The system is already at the breaking point. After years of buck-passing and underfunding, subway delays have increased by more than 250 percent since the beginning of the decade. A few inches of snow recently caused an apocalyptic evening commute for workers across the entire MTA service area (including New York and its suburbs), with riders lined up in the snow outside an overcrowded Penn Station and children held late in schools because of dangerous road conditions. The 7 and G lines in particular have faced years of poor service and significant shutdowns for repairs — and these are the two lines most likely to see a significant influx of riders with the new Amazon office and the temporary closure of the L line, which runs roughly parallel to the 7. Since 2012, ridership at the 7 and G stations closest to the Amazon site has already increased 37 percent and 26 percent, respectively. It is possible that the MTA is crying poverty in part to position itself to demand concessions from Local 100. However, it appears that fare increases and cuts to service would not come close to balancing the agency’s budget. And Governor Cuomo has made clear he refuses to increase taxes even on the wealthiest New Yorkers, whether to fund MTA or for any other purpose. Instead, Cuomo favors a congestion fee on cars entering busy parts of Manhattan to increase MTA funding. Even if the fee passes this legislative session — which is far from certain — it will likely take significantly longer to implement. In short, Cuomo needs the subway to run well to please Amazon, but MTA is on exactly the wrong track. Yet it is unclear where the heavily indebted agency with urgent capital construction and repair costs can turn to fix its state-inflicted budget crisis other than to demand concessions from its workers. Where does this leave Local 100? Historically a fighting union with a relatively high degree of rank-and-file participation and leadership, Local 100 has become an almost comically strong Cuomo ally in recent years, aggressively blaming New York City mayor and Cuomo nemesis Bill de Blasio for the subway’s woes. In some respects, it may have been in the union’s short-term interests to work more cooperatively with the boss. It faced legal repression and serious financial penalties following a haphazardly planned illegal strike in 2005. This collaborative strategy allowed it to focus on training shop-floor leaders and grind out modest gains beyond those of other public sector unions, even if union officials’ claims they agreed to no givebacks were exaggerated. But given the mounting pressures on the transit system, it is uncertain whether that strategy will work this time around. 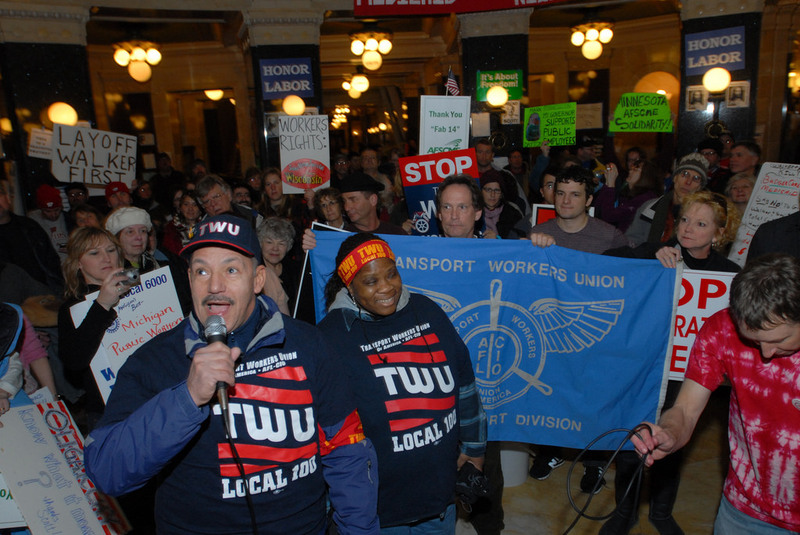 And Local 100 members could instead revive and expand previous efforts to directly link the interests of workers with the interests of riders as part of a more aggressive contract campaign. In the Cuomo-Amazon alliance, the union has a perfect target for such a campaign. The arguments almost write themselves. Public money to bring Amazon to the city came seemingly out of nowhere, announced a mere two days before the MTA said it would almost certainly be cutting service due to lack of funds. Instead of paying to fix the subway, the money will go to an extremely wealthy corporation. Combined with a big influx of mostly wealthy riders, these factors directly impact workers’ job stability and working conditions. At the same time, current riders will face longer waits, more crowded trains, and higher fares. Local 100 could seek to mobilize both workers and riders along these lines, demanding that the state invest in the MTA and its workforce rather than a large for-profit corporation. Local 100 could also ally with Queens community groups to put pressure on the state and the city to meet some of their demands and alleviate the worst effects of the new Amazon campus. The particulars of any alliance would need to be worked out, but it would have advantages for both the union and working-class New Yorkers in Western Queens. Currently, community organizations lack any real leverage to move the state to accede to their demands. Such an alliance would bolster Local 100’s hand by demonstrating strong community support for a contract with greater gains. And the implicit threat of a strike or other workplace action would give the broader community greater leverage to extract concessions from the state or, indirectly, from Amazon itself. Such a strategy would, however, require a Local 100 to make a decisive break with Cuomo. And based on their recent history, it seems Local 100 officials are likely unwilling to take that step right now. The choice is clear, though. A New York union with a high degree of structural leverage in the city’s economy has the chance to organize against an unpopular enemy to win significant gains for both its workers and working-class New Yorkers as a whole. Such an approach carries big risks. But in the current fiscal climate, so does the strategy of allying with the governor. Which path will the union take?